Rey Rodriguez, AAF, AIFD, TMFA, of The Gypsy Florist in Austin, Texas, was named the winner of the Society of American Florists’ 50th Annual Sylvia Cup Design Competition held during SAF Palm Springs 2018. The win earned Rodriguez the coveted Sylvia Cup trophy and a $3,000 prize. Lee Burcher, AIFD, CCF, PFCI, of Fleur de Lys in San Pedro, California, received second runner-up honors and $250. Burcher won Sylvia Cup top honors in 2004. Certified American Grown sponsored all of the cut flowers and greens for the live competition. The Sylvia Cup is the country’s longest running live floral design competition. It began in 1967 and is named for Sylvia Valencia, a prominent designer and long-time SAF supporter. This year’s competition — the contest’s 50th anniversary — paid homage to “The Wizard of Oz.” The event was sponsored by Certified American Grown and Smither-Oasis and coordinated by Professional Floral Communicators-International. 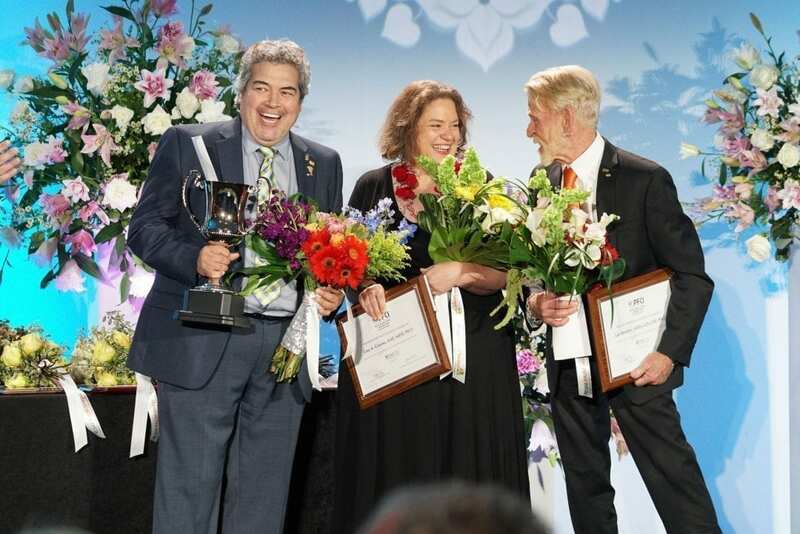 Among the 19 floral designers competing were 12 members of the American Institute of Floral Designers, eight past Sylvia Cup contestants and three contestants sponsored by state floral associations.